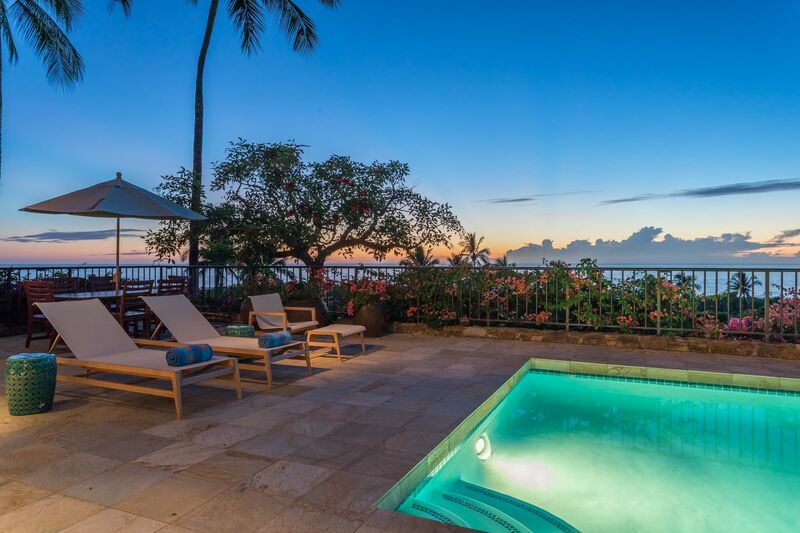 Relax and luxuriate in this spacious and bright four bedroom luxury property, newly renovated, redesigned and brand new to the rental market! Professional and cheerful Fine Design interior decor echoes tones of the nearby Pacific. 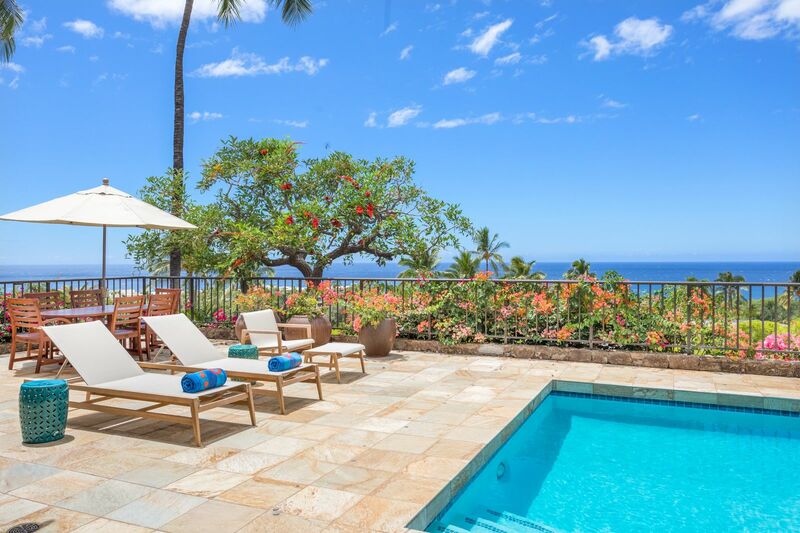 Unwind on the generous pool deck and covered lanai and enjoy fabulous ocean, coastline, sunset and Maui views year long. 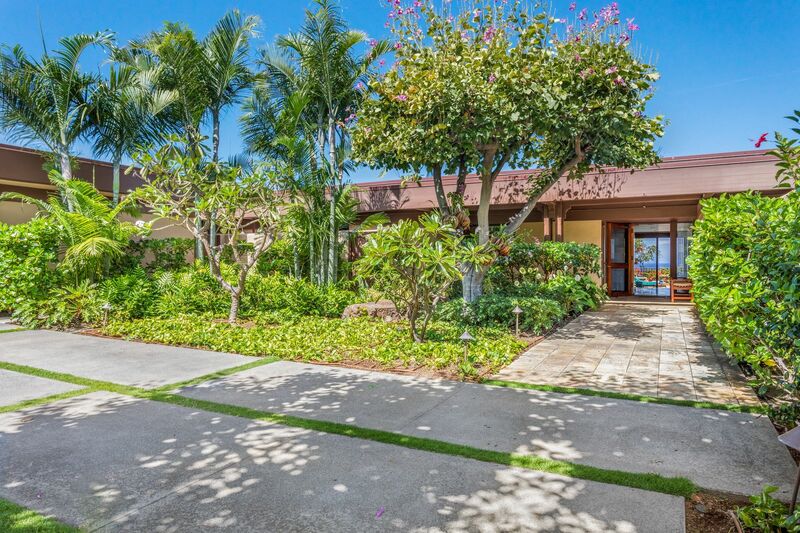 Central air conditioning is offered throughout the villa, though the open floor plan and multiple sliding glass doors create such delightful breezes, you may not even need it! 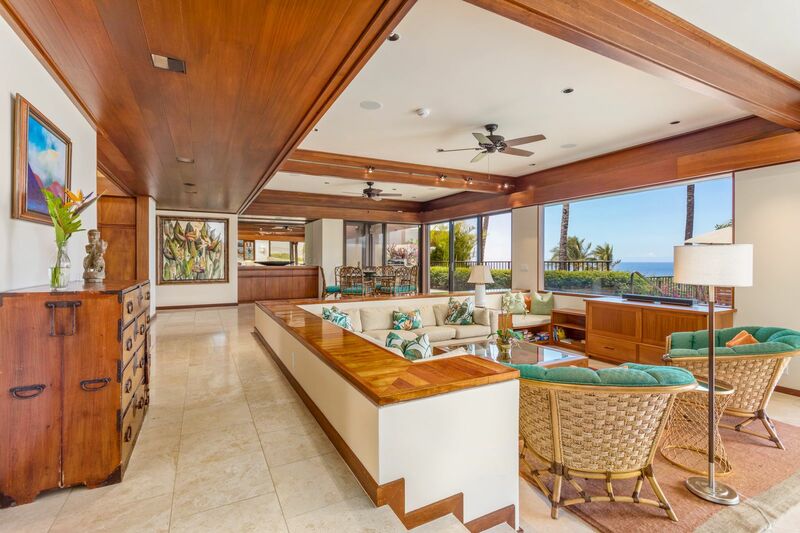 A regal foyer opens to the great room offering ocean and sunset views from the living area, dining area, and kitchen. Exquisite natural light, high valance ceilings and elegant woodwork highlight the refined furnishings, fixtures, and decor throughout. 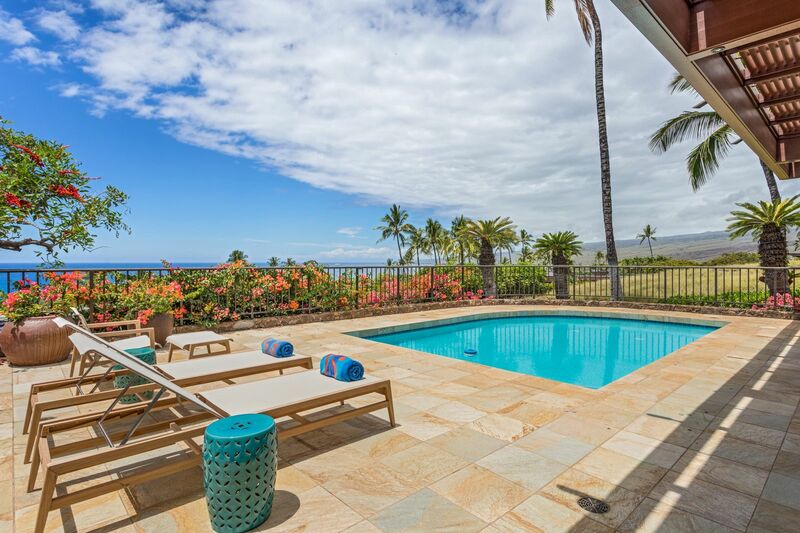 Sliding glass doors open from the great room to the lanai and pool deck, where you can watch the humpback whale migration from December to April. 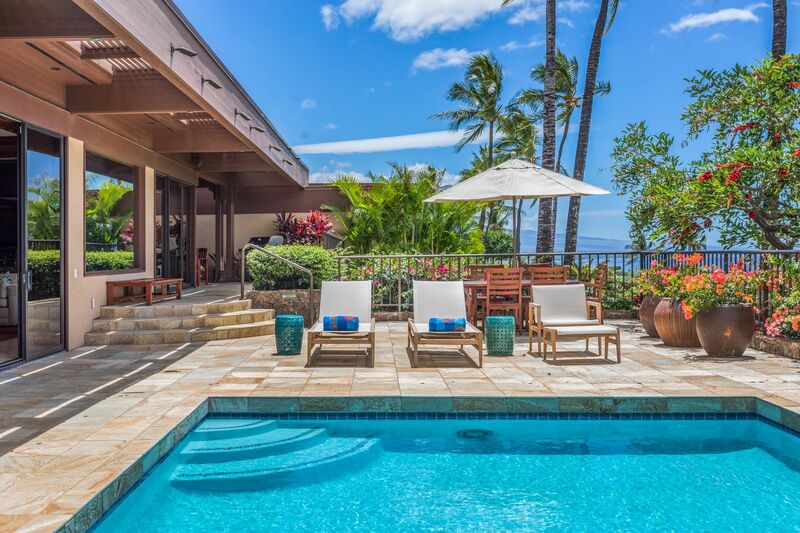 The capacious ocean view lanai offers a private pool, Weber BBQ grill, open air dining set, breakfast set, pool loungers, and plush sofa and armchair seating. 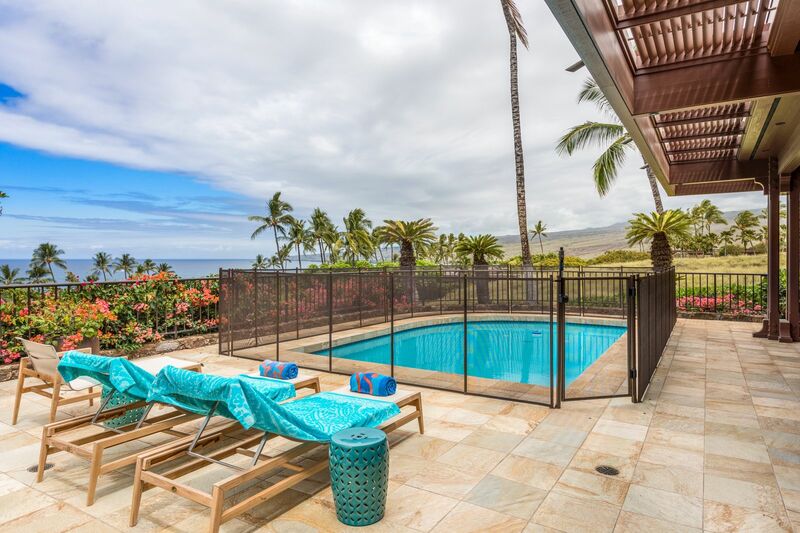 A keiki (child) safety fence can be erected around the private pool by request - extra charge for set-up and breakdown applies. A Pack N’ Play travel crib is included in your rental. 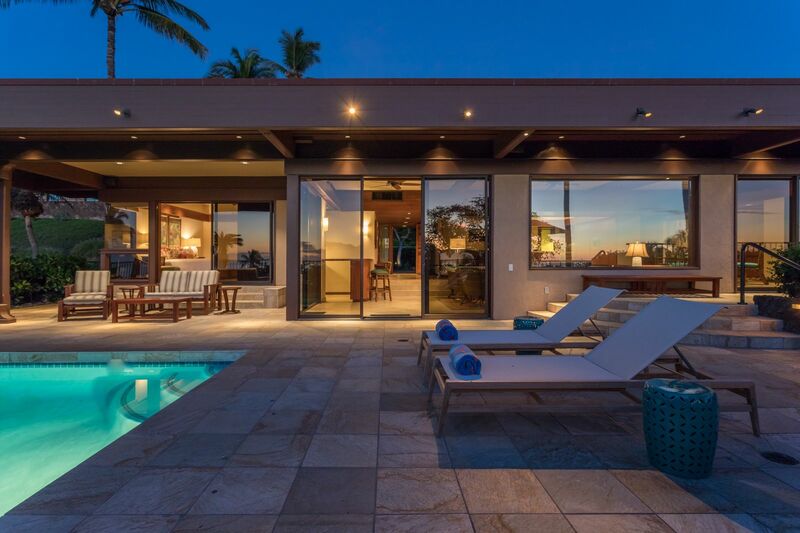 The recessed living area is defined by a gorgeous koa frame and boasts a hidden flat screen TV in a state of the art remote-operated custom cabinet with Sonos speaker bar and additional Sonos speakers throughout the home. A wet bar just off the living area is stocked with modern drawer-style fridge and freezer, hammered pewter sink, glassware and bar accessories. The formal dining area is equipped with a beautiful dining set for eight. The gourmet kitchen is outfitted with granite countertops, sandstone backsplash, and high end appliances including a built-in Miele espresso maker. Pack light! The laundry room off the kitchen has oversized washer and dryer, laundry sink and folding area. 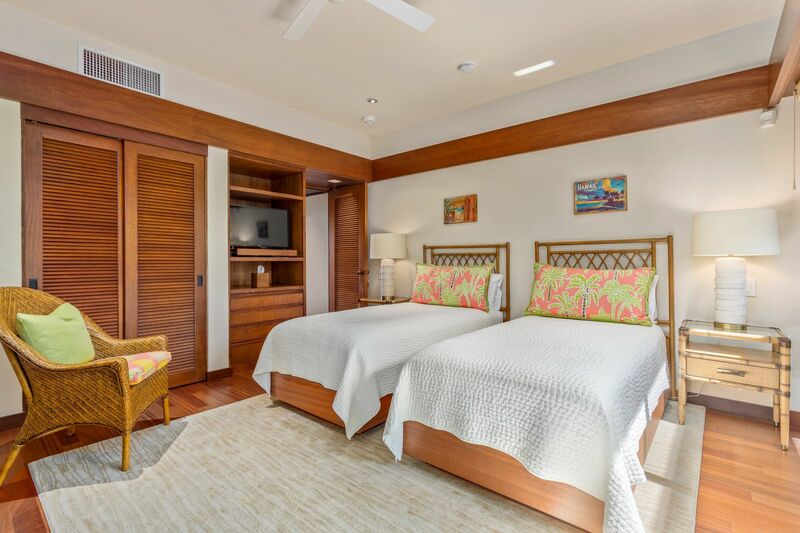 The master suite is furnished with a king bed, 45” flat screen TV, Mayumi Oda artwork, sliding doors to the lanai and pool deck and ensuite bath. 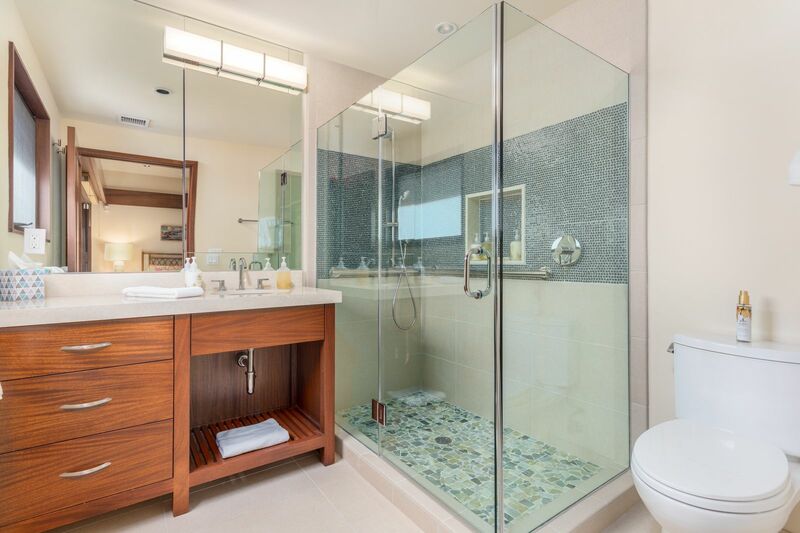 The ensuite master bath offers dual sinks, extra vanity area, flat screen TV, privacy commode, walk-in shower and outdoor shower garden. 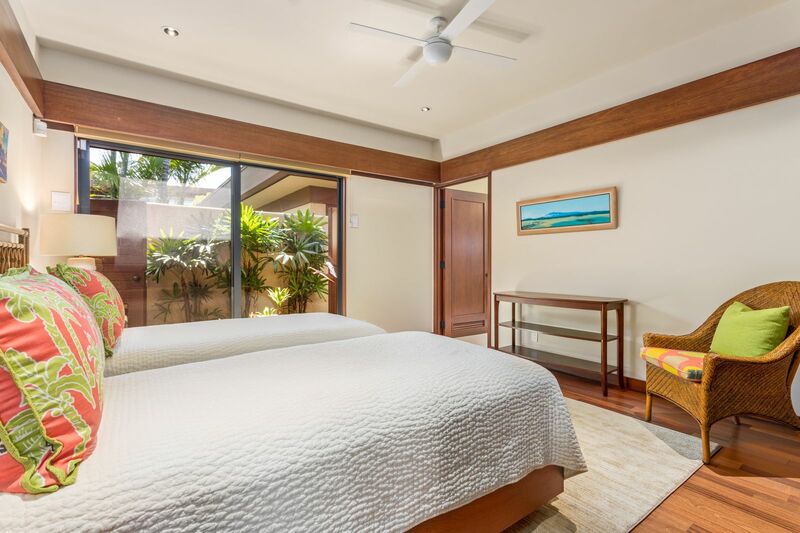 The second bedroom has two twin beds (can convert to a king upon request), flat screen TV, built-in cabinetry, sliding doors to private courtyard with lounge chair, and an adjacent full bath just across the foyer. 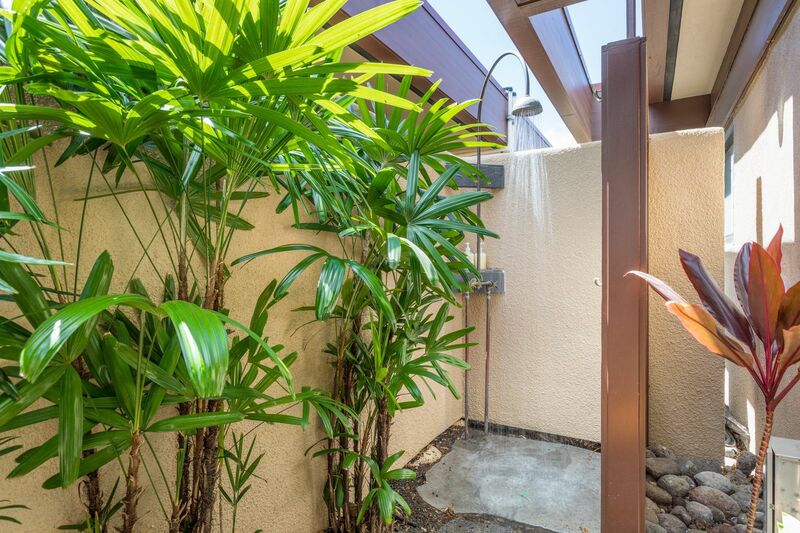 The 2nd bath has a unique wide and deep sink, walk-in shower and iridescent tiling reminiscent of a mermaid’s tail. 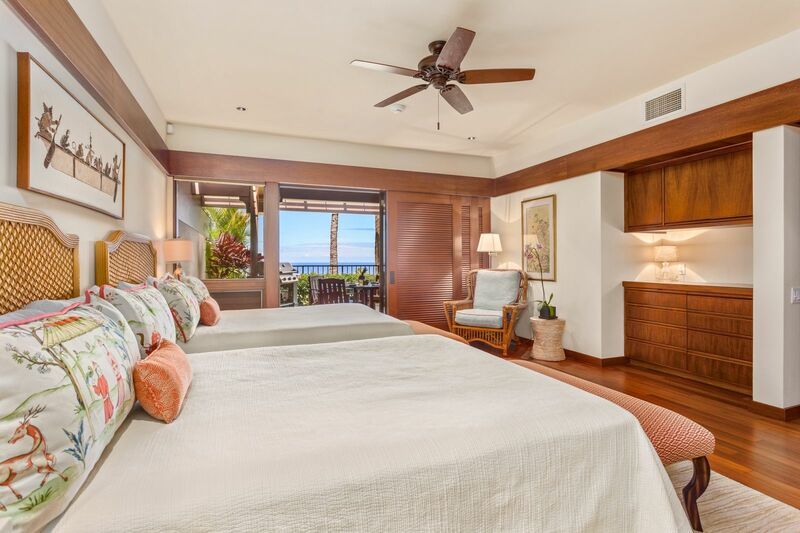 The third bedroom offers two queen beds, flat screen TV, ocean views, sliding door to upper lanai with breakfast table, and ensuite full bath. 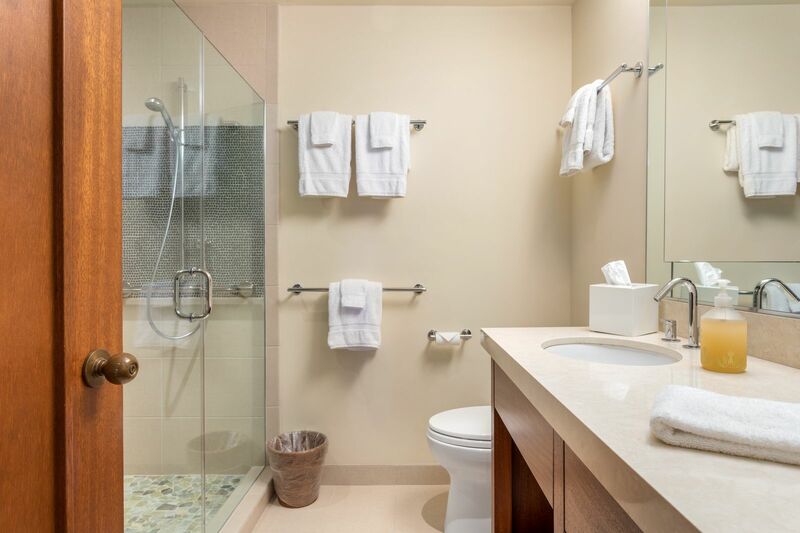 The newly renovated full bath features lovely tiling, walk-in shower, and soft-close custom cabinetry. The fourth bedroom is outfitted with two twin beds (can convert to a king upon request), flat screen TV, a newly renovated ensuite bathroom identical to the third bath, plus sliding doors to a private courtyard with outdoor shower garden. 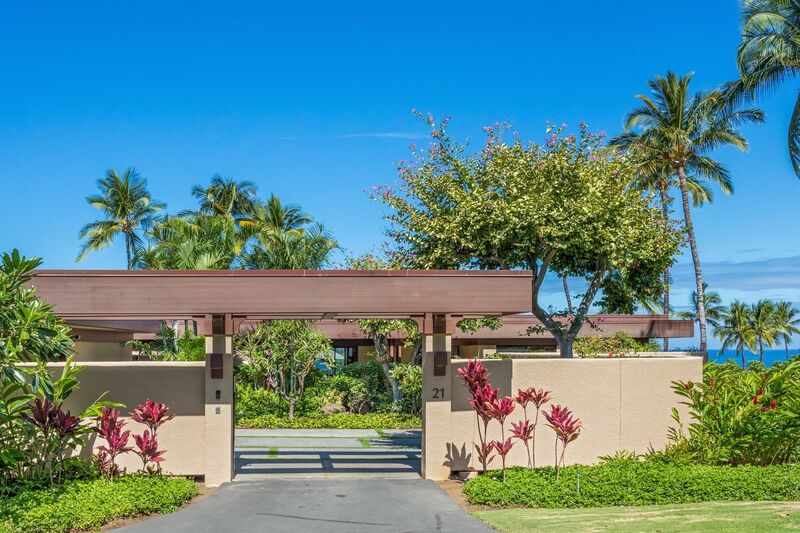 Guests staying at Villa #21 have the option to enjoy full resort privileges to both the Mauna Kea Resort and the Hapuna Prince Resort with payment of an additional fee directly to the resort. 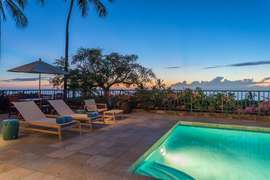 The villa is situated in a prime location, about a ten minute walk (or one minute drive) from the resort beaches, golf courses, spa, hotel pools and exercise facilities. We provide beach amenities such as boogie boards, snorkel gear, beach chairs, beach towels and more to assure your adventures on and off property are thoroughly equipped!